I’ve never been one to spend a lot of money on my hair. I get it cut once a year, never color it, and use the same $20 curling iron that I’ve had for what feels like ages. However I also feel like this makes me more aware of using the right products to keep my hair shiny and healthy. For me that means focusing on products that introduce lots of moisture, protect from heat, and have the ability to re-plump my texture. 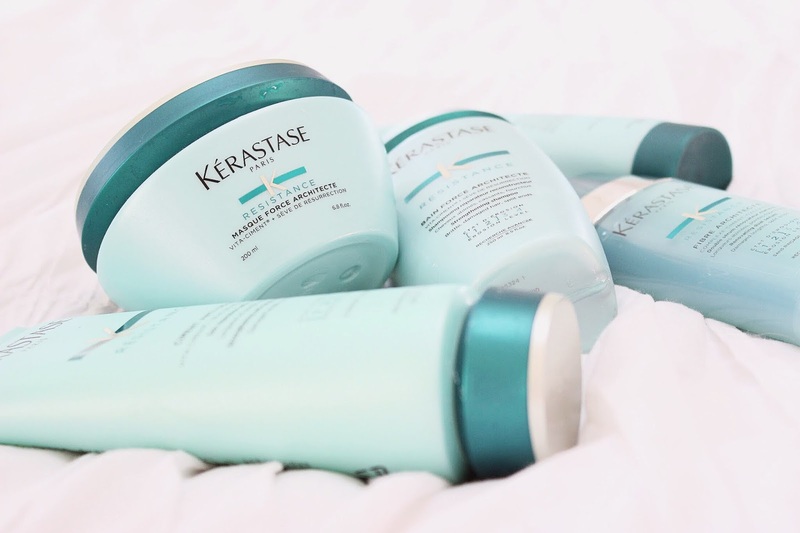 I have always been intrigued by Kerastase products but never made the plunge into the ‘designer’ brand. Recently I was introduced to their Resistance line and was immediately intrigued. 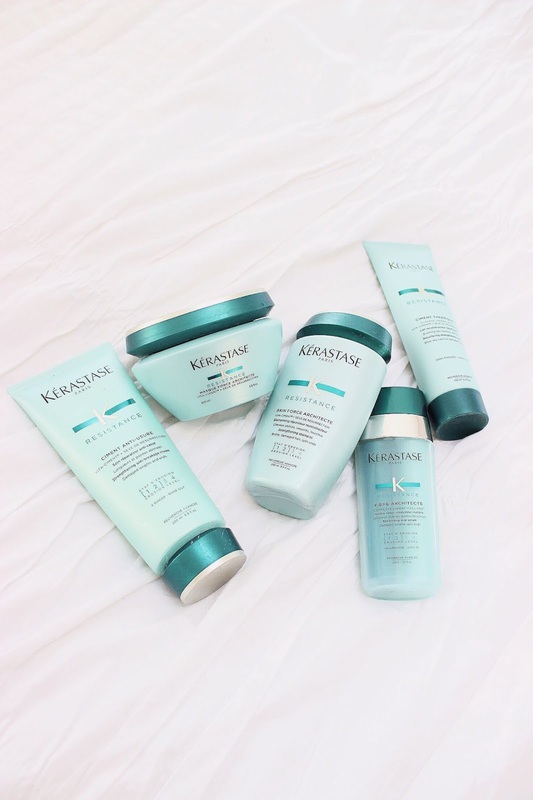 The collection is focused on rebuilding weak and damaged hair – which is fitting for the Summer months when the sun, salt, and chlorine are constantly battling moisture levels in your strands. 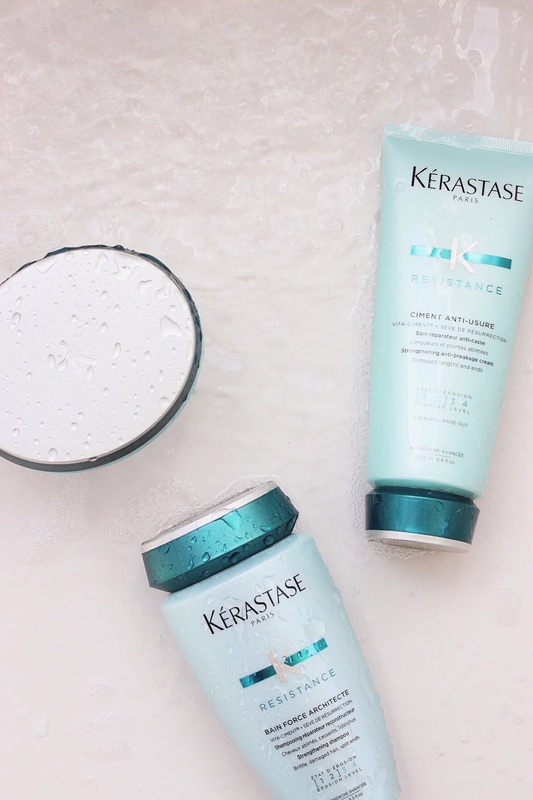 The Resistance line follows what I would consider a two prong strategy towards hair health. Not only is it important to nourish your hair in the shower but it is equally as critical to treat your hair out of it. I start my cleansing routine by using the Bain Force Architecte shampoo as I would normally lather up. Personally I always twice shampoo my hair: first with a conditioning scalp treatment that scrubs any oils/product out of my hair (normally a Head & Shoulders) and then I follow with a standard shampoo to give volume and body. The Architecte shampoo fell into that latter role. The product itself was very sudsy and felt like it stripped my hair a bit. I can imagine it’s due to the sulfates, which I tend to stray away from. Post shampoo I follow with a conditioning treatment, which again is a two step approach. I use a small amount of the Ciment Anti-Usure conditioner on the top of my hair and then the Masque Force Architecte hair mask on the mid to bottom length. 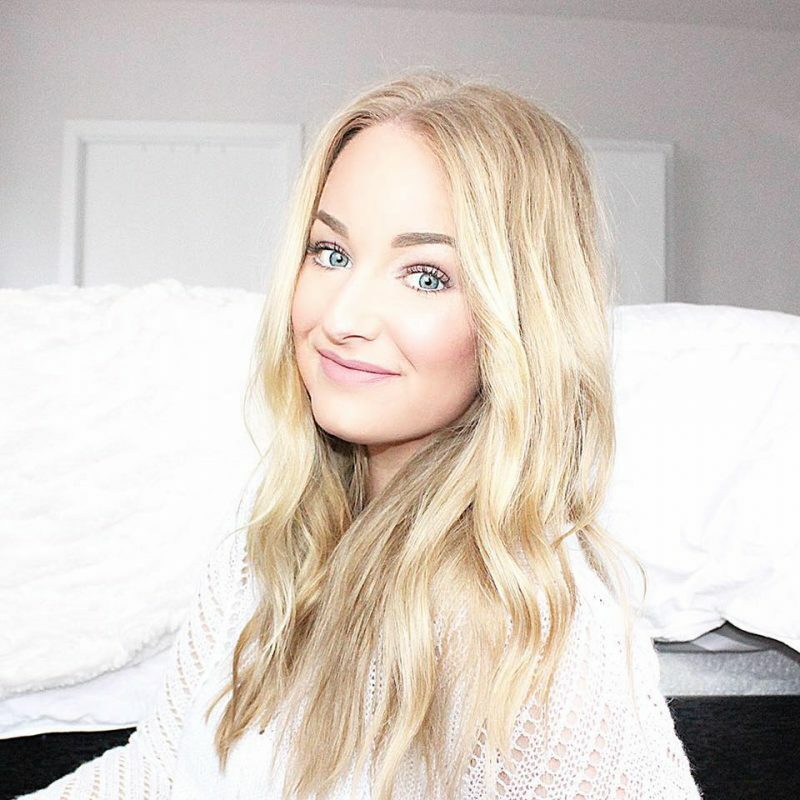 I find my ends to need a heavier product than my roots so I tend to use a hair mask every time I shampoo – which is twice weekly. 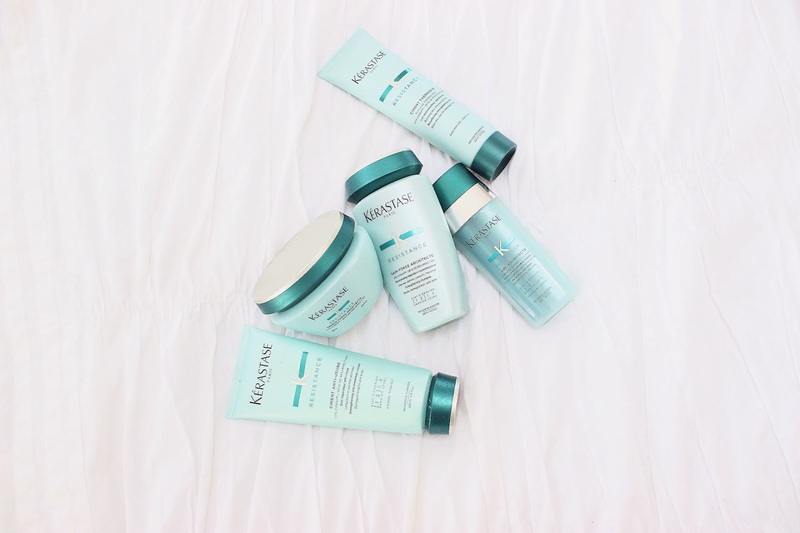 The Kerastase mask states that it should be left on for 5-10 minutes which I feel to be a bit of a stretch of time. I normally leave mine on while I body wash and the benefits are the same. After rinsing the conditioner and mask out I found that about half of my knots were still there but my hair felt smoother and like it had less split ends. Air drying for me is key in the Summer months. I always try to let my hair naturally dry for as long as possible but do require pulling out the blow dryer to get the last bit of dampness out. Second to a conditioning mask, a good serum is crucial to my hair health. The Ciment Thermique – a leave-in treatment – and Serum Therapiste – a dual serum – partner together to protect against my need for a blow dry and the occasional styling. The products are similar in that they both are used on towel dried hair before any heat styling. Out of the two products I found myself more impressed by the leave in treatment. It has a creamier texture than the Serum and better smooths out any remaining frizz or dryness. I tend to use the Serum more on dry hair throughout the week when I feel like a bit of shine is needed. Packaging wise the collection is up to par. My only qualm is that majority of the instructions are broken out in about ten different languages on the small bottles so it takes me a few seconds to figure out what product is which and what I need to do with it. I also feel like some of the instructions are just un-realistic (i.e. applying a hair mask for 10 minutes while in the shower). I’m a big advocate for straightforward hair care that I don’t have to think about. I want it to work, be simple, and smell good. 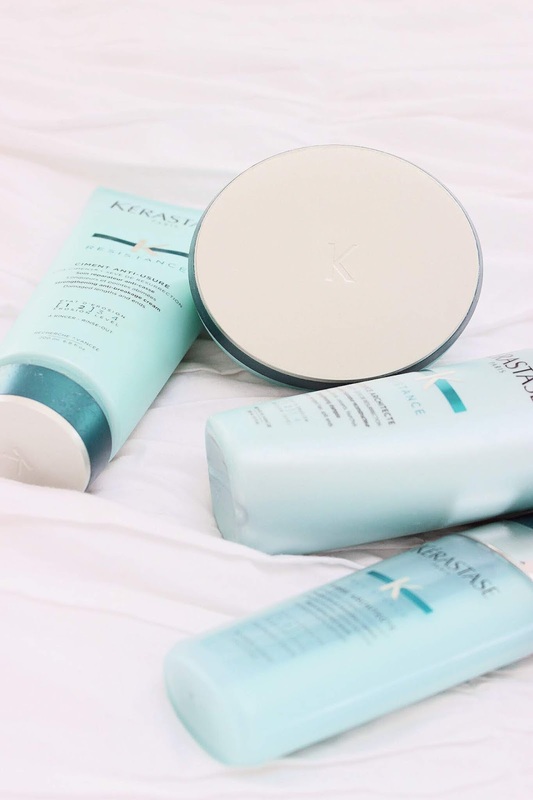 Speaking of scent: I can’t speak for all of Kerastase products as this is the first I’ve tried out but I was a bit underwhelmed. The Resistance collection is fresh but fairly basic. It could compare it to a cucumber scent or something similar. As a huge lover of lines like Kristin Ess and Oaui – both of which are known for their perfume-like scents – it’s hard to compare.